The model is Batty and the MUA was Kelly Ingram. Batty has been on the cover of GB before. 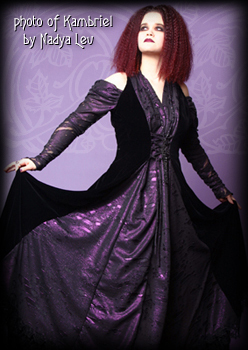 She designs her own gothic clothes but when she came for this TFP shoot she wore another designer – Kambriel’s – dress. When Kambriel saw the pictures she asked if she could send them in for the story they were doing on her. The magazine had requested her to send a bunch of images in and they would pick which ones to use. I said sure and sent her a number of the images from the shoot. There were three pictures in the article, 2 by Naydia Lev, who is one of the best Gothic fashion photographers out there. And one by yours truly. Just for completeness, here’s the image opposite mine, which is of the designer in one of her dresses. And here is the other used at the end of the story. As an object lesson, let me point out this was my second TFP shoot. I screwed up and shot a lot of stuff wrong, with the color balance off. This particular image was underexposed, the blue background was an experiment and I didn’t like it. But in the end it was good enough for publication. You never know what a TFP shoot might turn into.